The Mindfulness in Schools Project community is coming together to mark Children’s Mental Health Week 2019 and to raise awareness of the need for young people to develop skills to support their own wellbeing, both inside and out. We are inviting teachers and students from primary and secondary schools all over the world who have introduced mindfulness to join the MiSP team for a mindful sit during the week of 4th to the 8th February 2019. All schools need to do is identify a group of students and/or staff who would like to take part in a mindfulness practice for around five minutes and decide on a place and time to meet during the week. The sit can be silent, led by a teacher, or involve the use of a free audio download of one of the MiSP .b practices to guide the sit. The MiSP Team will sit together at 1pm on Wednesday 6th Feb, so schools are free to do the same or choose another time that suits them. Click here to register to join the Team sit. 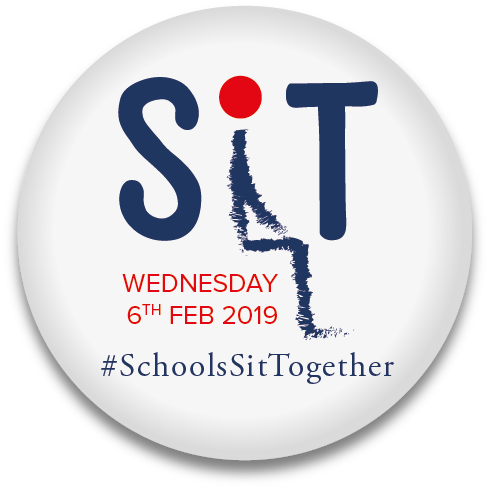 We are encouraging participating schools to share their sits with us on Facebook and Twitter, using the hashtag #SchoolsSitTogether and there’s a certificate and online badge for those that complete it, for you to display on your school website along with posters to let others know what you are doing. MiSP is aiming to bring mindfulness to as many children as it can. #SchoolsSitTogether is part of that initiative, so please let us know how many of your students participate or, better still, send us a photo of the group who took part before or after your sit (make sure you get consent to do so) and we’ll list your school on our website! Mindfulness in Schools Project (MiSP) is a national, not-for-profit charity for young people and schools. MiSP was established in 2009 to bring the benefits of secular mindfulness to the classroom. Now the leading provider of school-based mindfulness, we deliver well-researched, in-depth curricula and materials for schools and train teachers to deliver them. Find out more.